Pulacayo, Industrial Heritage Site is part of the Tentative list of Bolivia in order to qualify for inclusion in the World Heritage List. I visited Pulacayo as part of my Bolivian trip (Sucre-Potosi-Uyuni-La Paz) to tick off the WHS (and TWHS) in that area. 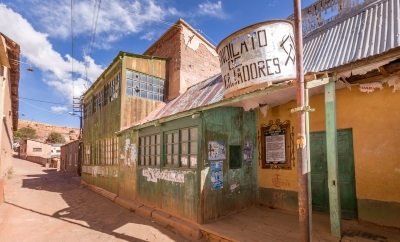 Pulacayo isn't on many itineraries but it's just 20 kilometers from Uyuni. Most tours go to the train graveyard of Uyuni but I think Pulacayo is much better. The entrance fee is small and I do recommend taking a guide there (just a small fee) or if you're with a driver like me who speaks spanish and is local take him. I was able to get into the Aniceto Arce house as there was a historian doing research / cataloguing all the papers. Bedrooms, livingroom etc etc are all in good order with furniture still. Also it was interesting to see (in my case from 1944) a book with the results of the mine. There was a lot of reconstruction going on at the site. They are preserving it well and i think it deserves to become a full WHS soon. Yes there are other sites maybe in other countries, but as this is important for Bolivia I think they deserve this nomination. I recommend everyone to go; plan half a day either from Uyuni or if you drive from Potosi to Uyuni (which was what I did). For my 2017 trip to South America I ventured a bit off the beaten path, at least in terms of WHS travel. A colleague more or less implored me to include the Salar de Uyuni in my itinerary. At first I was a bit hesitant as Uyuni is not on the list, so doing the detour and spending three full days here, seemed excessive. Eventually, I gave in and made my travel arrangements accordingly. And I have to concur, Salar de Uyuni is a great place to visit and it was the highlight of my trip. Still, I was left wondering if there was anything that I could take away as a WHS traveler. Thanks to our great map, I noticed that nearby Pulacayo was listed as tentative site. And so I squeezed in a visit while travelling from Uyuni to Potosi. The site itself is an abandoned mining town around the second largest silver mine of the 19th century. At it's peak more than 6000 inhabitants lived here. The number nowadays is down to less than a thousand. Mining eventually stopped in the 1990s. With all the former mining buildings and facilities the site has a great feel and is very photogenic, a bit like Fray Bentos in Uruguay. I would have loved to explore more of it, maybe venture Into the mine or have a guide provide some context, but due to time constraints I couldn't. Plan at least two hours. If you are in the area and you enjoyed the cemetery of trains in Uyuni, you should definitely find time for this. I am a bit torn here. The experience of the site is great and with all the decay and abandonment it certainly is a very nice motif for pictures. Meanwhile, being picturesque should not suffice for inscription. The overall preservation state is poor. 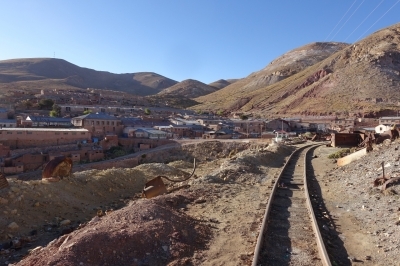 The question arises if a better preserved and still active site as Sewell doesn't already address the area of 19th century Latin American mining town sufficiently. In any case, the Bolivian list hasn't progressed much the past decade, so I am doubtful we will have Unesco's verdict any time soon. From Uyuni you can either take a cab or a colectivo. The cab should be around 50-70 Bolivianos, the colectivo significantly cheaper. Coming from Potosi by bus, you can ask to be dropped off at Pulacayo. If you have luggage, you can leave it with the guards at the entry to the site. If you plan to continue to Potosi, you should be able to catch a bus every 30min or so from the town's bus stop, emphasis on should. The only bus that stopped in the one hour I waited was full and would not take me. Eventually, I returned to Uyuni and boarded a bus to Potosi there. Ironically that one actually did stop in Pulacayo. Be aware that you will be above 3800m. If you do the Uyuni tour you will reach 5000m. The altitude should not be treated lightly. A Salar de Uyuni trip should be part of any travel itinerary in Bolivia. This is a great experience and I really am at a loss why this isn't on the list itself (potentially combined wit the Chilean side, the Atacama Desert). Default trip length is three days (two nights) and total costs including board and lodging should be around 100 to 150€ depending on the agency and the language of the guide.